Schulte & Company Races To The Finish Line! Schulte & Company has decided to take its pencil pushing talents to the racing strip. Last month, the annual United Way Corporate Derby Challenge presented by Fallsway Equipment Company hosted an event that allows businesses in the area to show their competitive side. The event hosted activities consisting of trial runs for the teams, fun runs, food trucks, tailgating, and the Corporate Derby Challenge competition. 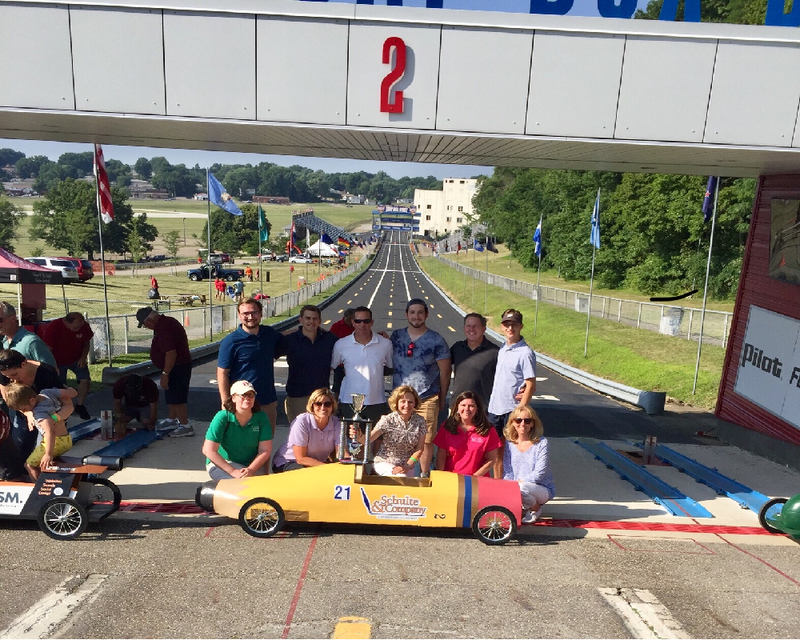 Our team, lead by driver Sophie Veillette, managed to sweep the competition to place second in Schulte & Company’s first ever Corporate Soap Box Derby. Our staff worked countless hours to prepare, assemble, and decorate the derby car preceding the day of the race. A big thank you to Gerald Stout president of SpeedPro Imaging, for the amazing company logo! With honorable mention to Bob Zupke for his experience and wisdom, helped our staff be in tip-top shape through the final race. Schulte & Company CPA’s Celebrates 20 Years! Schulte & Company CPA’s is celebrating 20 years of business! Founded in 1997, the firm grown every year and continues to provide top quality tax, accounting and financial consulting to their clients. Nothing says you’re doing things right more than client retention. Schulte & Company is most proud of the fact that many of its clients have been with the firm for the entire 20 year run. In addition, the firm still services well over 90% of a client base it acquired in 1998; those clients are celebrating a 19 year anniversary. Happy clients only happen with a dedicated team of accounting professionals. With an average length of service of 9 years, the firm is blessed to have assembled and retained a quality group of professionals. In conjunction with the 20 year milestone, Schulte & Company recently completed an addition and renovation to their offices. After this second major addition/renovation, what started as a 1940s cape-cod residence has been transformed into a friendly work space with a vibe that can’t be replicated in a typical commercial office space. Clients and prospective clients are encouraged to visit and experience the difference. We are very excited to announce Alex Schulte will be joining us at Schulte & Company in November 2017. Alex arrives at Schulte & Company with substantial tax experience that he earned while working at a competing CPA firm. Building on his experience, he will be focused on tax compliance, planning and audit assistance; while also providing attest services to closely held businesses. Alex graduated from Ohio University where he earned a dual major in accounting and business pre-law. While at OU, he became a member and served in various capacities, including the finance committee, of the Phi Kappa Psi Fraternity. Alex played several intramural sports, was a member of the accounting club, and participated in countless community activities and charitable fundraisers. Alex is currently attending evening classes to finish the requirements for the Master’s degree in Taxation at The University of Akron and completing the requirements to obtain his CPA credential. We are very happy to announce that Josh Freedman returned to Schulte & Company CPAs in November 2017. Josh originally started with Schulte & Company in June 2012 and was a valued member of the team until November 2015 when he had to take a medical leave of absence. He brings back a spark that his co-workers and clients all enjoy. Josh will resume his duties of providing financial statements, individual tax returns, and accounts payable as well as assisting in computer-related issues. Josh obtained his Bachelor of Science in Business Administration with a specialization in Accounting from The Ohio State University. In returning to S&Co, he will resume many of his former duties including source document processing and classification for client financial statements and tax returns. He will also be charged with many of the firm’s technology duties. In August 2017 Donna Cottrell joined Schulte & Company CPA’s. We are thrilled to add Donna’s attitude and enthusiasm to the Schulte & Company team. Donna’s duties will initially include source document processing and classification for client financial statements, tax returns and payrolls. She will also be charged with preparing client 1099s as well as the assembly and delivery of tax returns and financial statements to our clients. Donna earned her Bachelor of Business Administration in Finance from Kent State University. We are very pleased to announce that Sue Simko will join Schulte & Company CPA’s in September 2015. Sue will focus on providing payroll processing services to our clients and will assist with our client’s accounting functions that have been outsourced to Schulte & Company. Sue comes to Schulte & Company with more than 10 years of pertinent experience; having previously worked with another CPA firm and in industry. Our company is growing and having Sue become a member of our team makes us better. Sue and her husband reside in Copley. Schulte & Company CPAs, Inc has revamped its website. The new website provides several useful tools for clients and a more complete description of the services and expertises the firm provides. - Legislative Newsletter that is published as warranted. For all three series of newsletters, the prior articles are archived and links to the the most recent news items appear right on the home page. - About Us which includes staff bios, the mission and firm history. - Services section contains a listing and descrption of the major types of services the firm provides. - Industries Served tab highlights some of the high end expertise the firm offers. - News contains a sign-up area for users to subscribe to any of the three newsletters regularly published by the firm. There is an archive of some recent newsletters. The "News" tab also contains press releases regarding the firm. - Resources includes links and common forms. The website is loaded with case studies and testimonials. The case studies are from prior engagements and, along with the testimonials, highlight how Schulte & Company can help to resolve some of the common opportunites that clients face. On May 1, 1998 Diane Crutchman became the first non-owner employee of Schulte & Company CPAs Inc. Fifteen years later, she is still here. Besides providing top quality service to our clients, Diane also serves as the firm’s Administrative Manager. Worth noting is that Diane has worked with many of Schulte & Company’s clients for much longer than 15 years. Diane’s career started with Dorsey Arnold CPA in 1978. When Mr. Arnold retired, his firm was acquired by Robert Lusk CPA and Diane went along for the ride. When Mr. Lusk passed away, Schulte & Company purchased the practice – and Diane came along. So while she is celebrating her crystal anniversary with Schulte & Company, she is actually celebrating her 35th anniversary serving our clients. CPA firms are required to have a peer review every three years. The peer review is generally conducted by another CPA that is independent and certified by the American Institute of CPAs and state accounting boards. The peer review process helps to monitor a CPA firm’s accounting and auditing practice and the goals of peer review include confirmation that the standards of the accounting profession are being followed and to ensure quality in the accounting and auditing services that a CPA firm provides. There are two types of peer reviews: Engagement Reviews and System Reviews. The less intensive Engagement Reviews are conducted off site. Schulte & Company CPAs Inc. receives the more complex System Review that is conducted on site by another independent CPA. 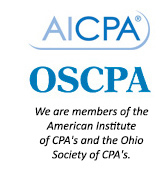 The findings of Review are forwarded to the Ohio Society of CPAs and the American Institute of CPAs who then issues its findings. Consistent with prior periods, Schulte & Company CPAs Inc. passed its most recent peer review without exception. Sophie Veillette leads the accounting and auditing practice at Schulte & Company CPAs Inc.